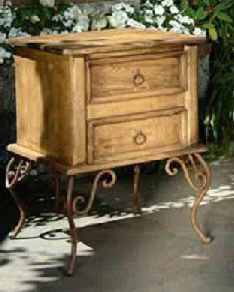 Solid pine combines with wrought iron to make this unique night table for your Mexican bedroom. Almost whimsical in its design, it reminds us of the confident and charming personality of its namesake: a true character! Beautiful curves and iron accents, lovely wood surface and understated rustic elegance.